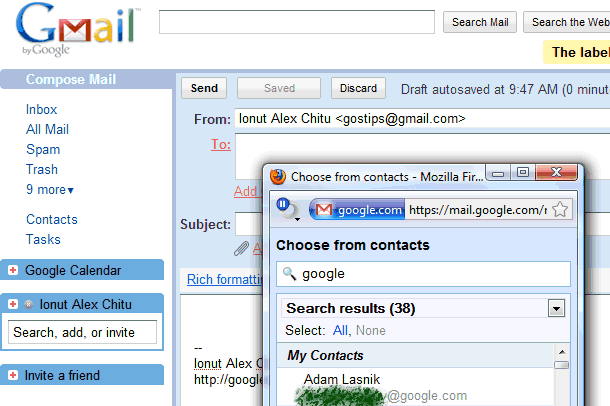 Gmail is probably one of the last Google services that adds a very simple feature: a contact picker. When you compose a message, you may want to see the list of contacts so you can select some of them. But this feature wasn't available in Gmail, although you could find it in Google Docs, Google Calendar and in almost any mail client and webmail service. Some people even wondered if you can send messages to more than one address: questions like "Why can't I load multiple contacts when I go to compose?" or "How do I compose using my address book?" were very popular in Gmail's help group. "Auto-complete is convenient and fast, and usually does the trick. But sometimes seeing your list of contacts can help you remember all the people you want to include on your email," admits Google. The wait is over and now you can finally use the contact picker in Gmail: just click on "To" when you compose a message, select the contacts and click "Done". * select contacts from one of your groups: just use the drop-down to choose from "Friends", "Family", "Coworkers" and other groups. * easily remove the contacts you've picked by just clicking on them. * manually add email addresses by clicking on an empty space from the picker's "to" box. * if you've already typed some addresses in the "to" box, the contact picker will include them when it launches. * add all the results of a search by clicking on "Select all". * the feature also works for "cc" and "bcc". I wish the same could happen in Google talk also, to send the same message to a group of contacts. My complaints: the contact chooser should NOT open in a new window. I agree, but it's a start. I found a workaround for Internet Explorer that doesn't work in Firefox: shift+click on "to". Agree, no more popup windows. At last! I have been waiting for this for AGES! I only wonder, why they put it under 'To:' and not used a 'Choose from contacts' link like already in use in e.g. Google Docs. It would have added a tiny bit of application compatibility. Are there no User Interface Design rules for Google developers? It often seems they all invent their own wheels without any concern for the users of the product. about bloody time, this was sorely missing for long time..
We use google apps for education. It would be nice if not just our contacts, but our domain users showed up in the contacts list without having to search for them. This is nice but I wish the "pop-up" was more like that when you insert a link, but an actual window. I am so happy this has finally arrived! I'm also more than happy to have a popup window. It's better than nothing. Thank you Google for FINALLY making this happen. And, thank you Alex for letting us know! There's one other thing that would be nice...make Groups an available option in the dropdown. This way you can select entire groups with 1 or 2 clicks! Just realized you can go to a pre-created group and then click Select All. Works almost the same as the previous post I submitted would. This is a very important feature that gmail didn't have. Now is the best mail on the web. Cheers! I also would appreciate very much a shortcut to "search contacts" in contacts screen ?? .... how about "//" ? I don't understand why everyone is thanking Google! This feature should have been included from day 1. Now that it's finally here, everyone seems so excited, even though the implementation of a new window is old school. Hotmail has a drop-down contact chooser that works so well. Having a new window is not user friendly. Also, if you click on To: but then want to CC: someone, that opens another window! Ridiculous! Will Gmail add this feature to group constitution ? the old version has the field where we can put all addresses we want too, and it is removed in the new version. It would be interesting to have again this. I don't think this feature is useful. Rather, it's a step backwards. Gmail provides an auto-fill feature to insert email addresses which does away with the need for a contact picker.